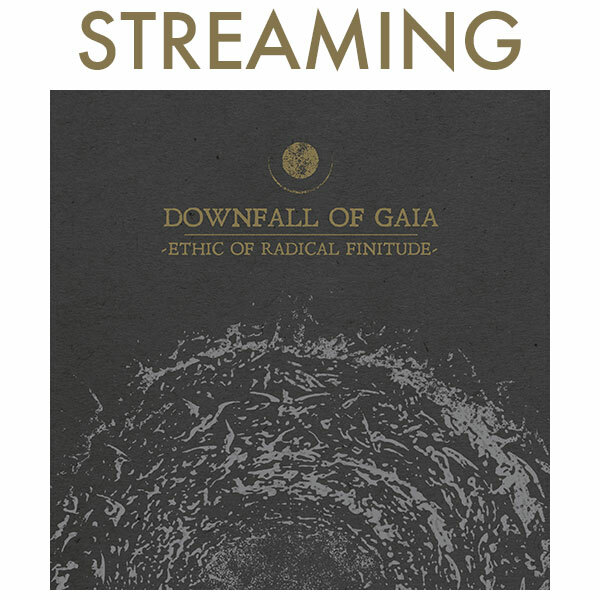 At every stage of their career, Downfall Of Gaia's output has been critically lauded and has garnered fevered responses from their devout fan-base, and their fifth album is primed to push things to the next level. Comprised of 6 tracks, Ethic Of Radical Finitude is the international quartet's most melodic, most structured and most dynamic release to date, once more building upon the epic and unique sludgy, crusty, exploratory metallic sound that has organically evolved with every release. "It combines elements from our earlier releases with the path we took on Atrophy (2016)," states guitarist/vocalist Dominik Goncalves dos Reis. "There are long atmospheric parts with enough time to breathe, enough time to unfold, and on the other side there are harsh and melodic blastbeats. Each song is some kind of journey, with emotional ups and downs." Feeling no pressure to rush, the band spent nearly sixteen months writing the songs that would come to comprise Ethic Of Radical Finitude. With Goncalves dos Reis taking the lead as the primary songwriter, he initially constructed demos in Berlin before sending them to drummer Michael Kadnar in New York, and the two worked out the drum parts over email. While some bands might meticulously plan out everything they want to achieve with their records as soon as they begin working on them, Goncalves dos Reis has always been more interested in going with the flow. "As long as it feels right and a song delivers the right atmosphere everything is allowed," he states plainly. "Each record is a different chapter of a different period of ourselves, of course with different influences, which is a good thing, because otherwise everything would sound the same. The only thing that's always important for us is to create a kind of atmospheric sound, including bright soundscapes which you are able to lose yourself into." Only once they were satisfied that they had the songs strongly demoed out did bassist Anton Lisovoj and guitarist Marco Mazzola enter the process. At that stage everyone's ideas were welcome, the tracks were refined, and Goncalves dos Reis arranged the lyrics. "We never started that early with the songwriting before. We usually complete this process in half the amount of time, but this time we simply didn't want to stress ourselves, and we wanted to give ourselves the space and opportunity we needed to get a satisfying result for all of us." Sonically, they also experimented with elements that are new to their records, utilizing clean vocals for the first time, incorporating chimes and spoken word passages in their more atmospheric sections, expanding the idea of what a Downfall Of Gaia record can be. Unlike its predecessors, Ethic Of Radical Finitude is not a concept album per se, but there is a core theme that unites the songs: discontented minds and the never-ending pursuit for more. "I guess everyone in life is trying to find this special 'warm' and safe place, their special place. To feel 'home', to feel 'safe', to feel satisfied. But maybe at some point you need to accept that it may never come, that you will never 'arrive'," Goncalves dos Reis asserts. Looking at life as a "book filled with chapters that can only be closed with death", he also believes that death itself has a bad reputation, and the context in which the album meditates upon it asserts this. "You can also see the good things in it. It's the only thing that makes the time you have worthy since without it everything would be forever, and nothing would have any value. No one would try to use their given time, no one would ever be on the hunt for their special place. It would be meaningless." Tracking for the album was handled at Hidden Planet Studio, Berlin by Jan Oberg, and Backroom Studios in New Jersey by Kevin Antreassian of Dillinger Escape Plan, and proved an entirely drama-free process, with everyone on the same page. A handful of guests also contributed their time, including some faces familiar to longtime followers of the band - rejoined by guitarist Peter Wolff, one of the founding members of Downfall Of Gaia, on "Seduced by…" and the drones on the songs "The Grotesque Illusion Of Being" and "We Pursue The Serpent Of Time" come courtesy of their former drummer Johannes Stoltenburg, aka Hidehidehide. "Working together and creating something new with former bandmates is a very special thing. Even if our ways had to split at some point it's a true pleasure to get together again, with everyone bringing in their own new influences," Goncalves dos Reis enthuses. Furthermore, they collaborated with Nikita Kamprad from Der Weg Einer Freiheit, who added vocals to "We Pursue The Serpent Of Time", and spoken words for the song "Guided Through A Starless Night" were supplied by their friend Mers Sumida of Black Table. "Ever since we met Der Weg Einer Freiheit in 2015 we have been good friends, and we kept the contact between the two of us alive. This definitely doesn't happen with every band you tour with so we are more than happy to also have Nikita joining our new record, which gives that one part a very special touch and a great dynamic! Having Mers reading the poem is also the perfect fit. Her voice perfectly captures the emotions and atmosphere we wanted to spread, so we are really thankful to her for being a part of the new album." When the band hit the road next year fans can expect to hear most of the tracks, marking the beginning of an exciting new phase in the life of Downfall Of Gaia. "Everyone was absolutely focused on this record, and I think this is something you can really hear in every song. All of us are more than satisfied with the result, and we're extremely looking forward to playing these songs live, and sharing it with the audience."